A SpaceX Falcon 9 rocket launches the classified NROL-76 spy satellite for the U.S. National Reconnaissance Office from Pad 39-A at NASA's Kennedy Space Center in Cape Canaveral, Florida on May 1, 2017. SpaceX launched its first-ever mission for the U.S. Department of Defense today (May 1), and a set of videos and photos document the historic flight in spectacular detail. SpaceX's Falcon 9 rocket lifted off from Cape Canaveral Air Force Station in Florida at 7:15 a.m. EDT (1115 GMT) today with the U.S. National Reconnaissance Office's NROL-76 satellite aboard. Less than 3 minutes into flight, the booster's two stages separated. While the second stage continued carrying NROL-76 toward its classified destination in low-Earth orbit, the first stage performed engine burns to prep for a touchdown at SpaceX's "Landing Zone 1," a facility at the Cape. Tracking cameras stayed on the first stage the entire time, capturing its various maneuvers and its pinpoint landing, which occurred 9 minutes after liftoff. The successful landing was the 10th overall for a Falcon 9 first stage, and the fourth at Landing Zone 1. The other six landings have occurred on robotic ships at sea; such ocean touchdowns are necessary on missions that burn up so much fuel that the booster can't make it all the way back to the launch site, SpaceX officials have said. These landings are part of SpaceX's effort to develop fully and rapidly reusable rockets, technology that company founder and CEO Elon Musk has said could revolutionize spaceflight by slashing its cost. 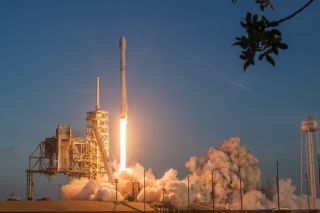 SpaceX took a big step toward achieving this overall vision on March 30, when a Falcon 9 with a "pre-flown" first stage launched the SES-10 communications satellite. That pre-flown Falcon 9 booster had first launched in April 2016. Eventually, SpaceX aims to launch, land and re-launch boosters within 24 hours, the company has said. Each Falcon 9 first stage is designed to fly 10 times with no hardware changes and 100 times with only moderate refurbishment, Musk said after the SES-10 mission. Today's NROL-76 launch broke a 10-year monopoly on U.S. national-security missions enjoyed by United Launch Alliance (ULA), a joint effort of Lockheed Martin and Boeing. SpaceX also holds contracts with the U.S. Air Force to launch global positioning satellites in 2018 and 2019. The National Reconnaissance Office (NRO) operates the United States' fleet of spy satellites. NRO missions tend to be classified, and NROL-76 is no exception; it's unclear what observations the spacecraft will be making from its perch above Earth.